The ability to accurately test drugs and therapies for human use is a goal we desperately need to reach. Often animals are used to test drugs intended for human use, which not only puts them at risk but many times does not produce results helpful to making these remedies safer for us. At the same time drugs tested on human cells grown in a petri dish doesn’t exactly represent how those drugs will react in a living, breathing body. 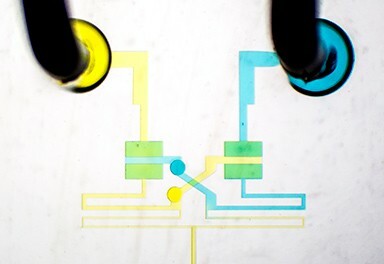 Fortunately, a development made by Michigan engineers has taken a major step in drug testing by reproducing the heartbeat in a simplified gravity-driven microfluidic circuit. This new device performs operations that once required a large amount of peripheral equipment as well as a dedicated lab technician to run. Beyond that, the chip can execute multiple experiments at once as well as mimic a variety of heart rates. With the help of this microfluidic chip we could see the testing phases for new therapies drastically shortened, allowing newer, more effective medicines finding their way into patients much faster. Shuichi Takayama is a professor having a joint appointment in Department of Biomedical Engineering and Macromolecular Science and Engineering. His work concentrates on creating micro/nanotechnologies for cell-based assays, cell-based therapies, and epigenetic & protein biomarker analysis. In addition, Takayama also focuses on microfluidic tissue engineering of miniature human body parts –such as a lung-on-a-chip, cancer-on-a-chip, and fibrosis-on-a-chip– in order to deepen our understanding of disease physiology and serve as a platform to better predict drug efficacy and toxicity.